Here's a great chance to cross 1 or 2 kids of your Christmas list! Today at Plum District you can get TWO personalized Disney story books for as low as $9.80! The two books include free shipping and cost $22, BUT use the code enjoy10 to take $10 off and make it $12.00, AND if you're a new Plum District member, you'll get $5 in instant credit (must use links in this post), allowing you to get them for only $7.00! That's $3.50 per book! Not bad for a deal that would regularly cost $44.00. 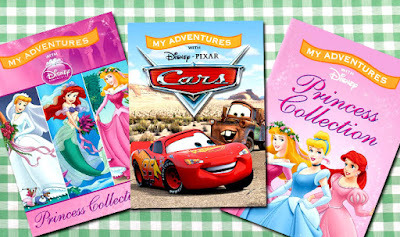 You can choose from Disney Princesses or Cars themes. The books can be personalized with your child's name, birthday, neighborhood and friends!. Thank you! Ordered this for my daughter - I appreciate you sharing the deals with us! I'm glad you saw this, and I bet your daughter's going to love it!